Back in the day when Oasis and Alanis Morisette were being played on the radio and boy bands were making a comeback after New Kids on the Block, I was listening to Jewel. I had two of her albums. They were cassette tapes that required you to rewind and fast forward to your favorite song. I’d listen to ‘Who Will Save Your Soul” and “Adrian” almost every day since I purchased the album. 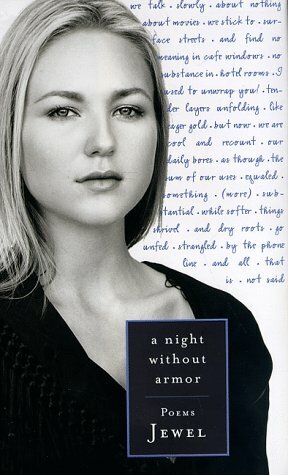 Her popularity then led to the publication of a collection of poems called A Night without Armor. When it came out I wanted to purchase it, but I was a kid on an allowance. I barely had any money to purchase an expensive book of poetry. So I let it be. I grew up and forgot that such a book even existed, until recently. I was scavenging in one of my favorite second hand bookstores and I found this young reader’s version of Jewel’s A Night without Armor. I thought for thirty-five pesos (less than a dollar) I might as well purchase it and read it. I read it last night. Before I give my impression of this book, despite its New York Best Seller status, this book was criticized as amateurish and vain. Put into context if she was not Jewel and popular the book would most likely not have been published. So then, does it have merit? Her poetry was not drenched in clichés, it was not singsong, and it wasn’t over indulgent in the vocabulary department. However, what do I know of poetry? I myself am an amateur learning to grapple through what makes poetry great and worth a publication as a collection. If any credit should be due this collection is that it is raw and honest. The lines are cut well. Its faults lie on its mixed metaphors and maybe even to an extent, its vanity. It is by no means comparable to the greats, but it should not be easily thrown because of what some critics consider as amateurish. Poetry is an expression of the soul primarily. It then becomes academic when we talk of publication and MFAs. Yet, I also believe in to those whose souls are made of poetry there is space to grow and learn. Hence, the question then is has her poetry grown since she last published. We’ll probably never know. If you like poetry for what it is and what it evokes, and not very critical then its worth reading, otherwise move on to Neruda. Looks like an interesting read. Well her songs are Poetry with melody. And I’ve always liked her. Of course Tori Amos is still of a way different league, but I like Jewel too. And I like the fact that she’s published a book of poems. Do post some of your favorites or those which appealed to your sensibilities. It was interesting. Though I’m familiar with Tori Amos and her music I have yet to give her lyrics a closer reading. I shall soon. Thank you so much for such a passionate and long comment. There is value to criticism, but as you point out things should be taken within a given confinement or context. Also, poetry speaks to its reader and if her work speaks to people then maybe that is the gift in it. I suppose as readers we come to a piece of work with very different purposes. Some come to critique, some come to enjoy and some come to prove their point. It is those who come to enjoy the work that gains more from it. Thanks again.